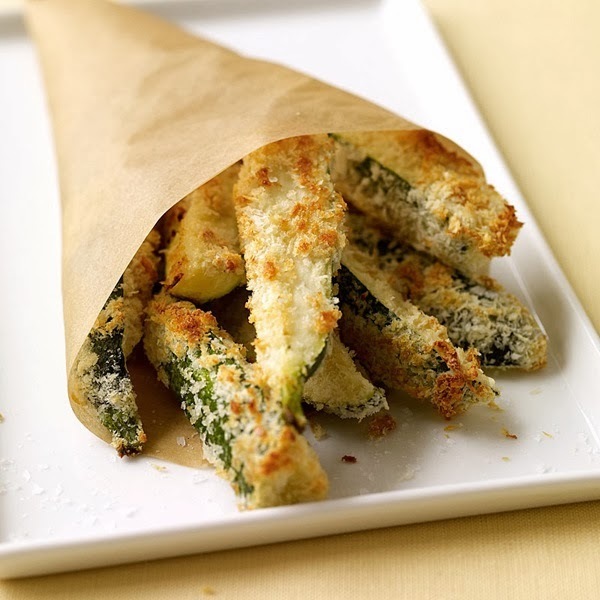 Looking for a creative way to get your family to eat their veggies.These Oven-Baked Zucchini Fries taste every bit as good as the deep-fried original version with only a fraction of the fat and calories. Serve with a side of your favorite marinara sauce for dipping. Another perfect "Super Bowl Snack"! 1/4 cup of your favorite all purpose gluten free flour Note: I like the Bob's Red Mill brand for both. 1/2 cup non dairy milk Note: I like to use the SO Delicious Coconut Milk, however if you prefer any of the other non dairy milks they will work just fine. 1 cup gluten free breadcrumbs Note: I used the Gillian's Foods Italian Breadcrumbs, but you can use whatever your favorite gluten free brand is or you can make your own by toasting any gluten free bread you happen to have on hand, and processing it in a food processor. Preheat oven to 475 degrees. Coat a large baking sheet with the cooking spray. Set up an assembly line: flour and spices in one bowl, milk in another, and breadcrumbs in a third. Dip each zucchini stick in the flour, then the milk, then the breadcrumbs and arrange, not touching, on the baking sheet. Coat all exposed sides with the cooking spray. Bake on the center rack for 10 minutes. Turn the zucchini and coat with cooking spray. Continue to bake for another 8 to 10 minutes, or until golden brown and tender.